Greg Roberts posted several video clips on YouTube that show reflections of light from the sides the satellite as it orbits the Earth. 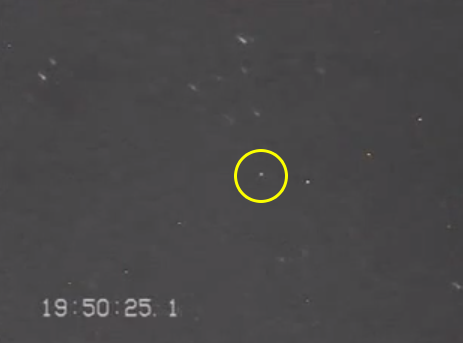 The clips are from December 20th and clearly show the flashes of light. The camera was set on a mount to track the satellite’s path, so the stars in the sky move past in the background. As noted in the videos, the camera has some dead pixels that appear continuously white. Ignore those and watch the center of the picture to see the flashes. As Roberts explains, the satellite is appearing to flash roughly every eight seconds. We know is taking about 17 seconds to rotate, so the eight second intervals correspond to reflections off every second surface as it tumbles. Roberts also posted video of the final stage of the Unha-3 launcher rocket, which is orbiting the Earth along with the satellite. The satellite was moving faster than my tracking mount could keep up with the satellite as it went through culmination ,and eventually it was able to almost catch up again after passing culmination. The mount then stopped tracking and the satellite was visible for a few more seconds before it went into earths shadow. While there are challenges to hearing Kwangmyongsong-3, the satellite has now made numerous passes over multiple satellite tracking stations — both professional and amateur run — and nothing has been reported. With each pass and each day that goes by, it begins to look increasingly likely that the satellite is either not functioning. UPDATE: I just came across some analysis of these videos by Marco Langbroek in The Netherlands. On his SatTrackCam Lieden blog, he includes some image analysis of the video that produces a slightly more accurate flash rate of 8.45 seconds. Take a look. 2 Comments on "Caught on video: North Korea’s satellite"
So is it broken, or did they just send up a non-functioning hunk of metal? I have this weird feeling the satellite was never meant to do anything, and that the important element was getting orbital insertion out of a North Korean rocket. If that is true, then they won.